A Gable conservatory creates a room with a higher front and therefore have a roomier feel. By using bi-fold or sliding stacking New Wave doors, this design creates a panoramic view. A new Gable Conservatory by Test Valley Windows will use the latest technology to ensure you will have a well-insulated extension to your home. With the correct combination of energy-efficient glass, solar reflective glazing and insulated walls and floors your new room will be cooler in the summer and warmer in the winter. Elevations on a gable conservatory are made up from a combination of your choice of windows and doors and glazing design options. 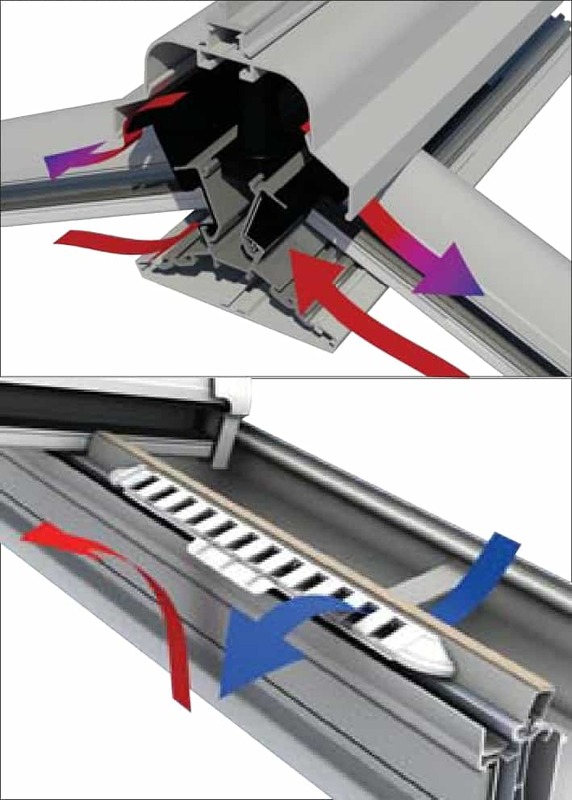 Our designers will help ensure you incorporate the correct level of ventilation through a combination of doors, window openers and roof vents. There are numerous designs that you can choose from for the gable frame. 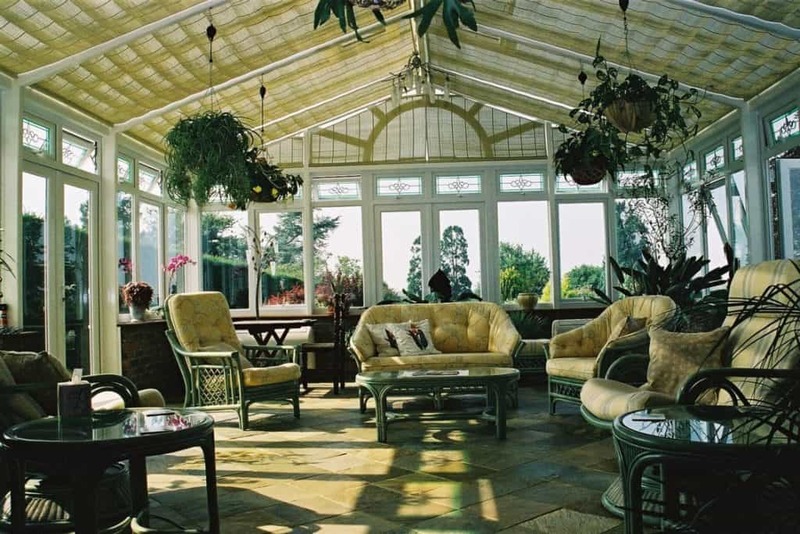 The above conservatory has a sunburst gable which was picked out from the detail in the round window, at the top of the picture. A few examples of gable frame options are shown further down this page. Walls are finished to your requirements with the above conservatory having inlaid panels of flint. 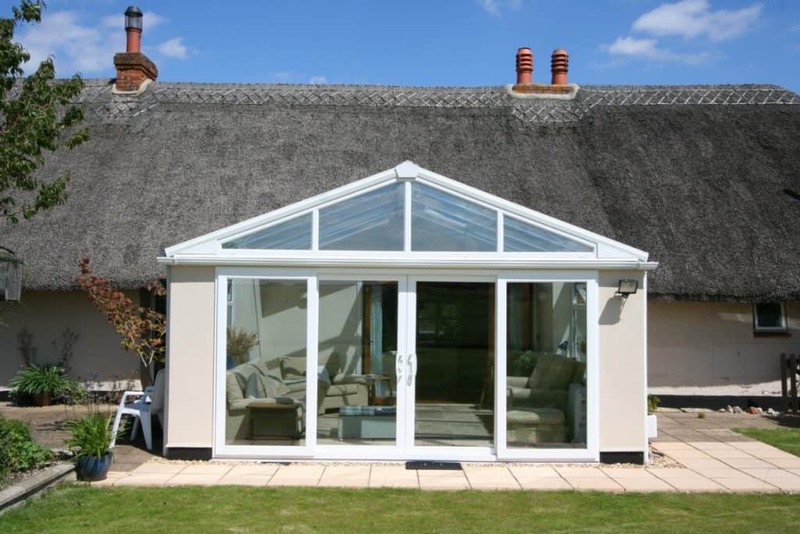 Frames are linked using structural joiners and posts, Loggia columns, brickwork or block work so that the weight of the roof is transferred to the foundations and not through the frames. Given that a gable frame roof glazing is rectangular, it is far easier (and cheaper) to have blinds fitted. 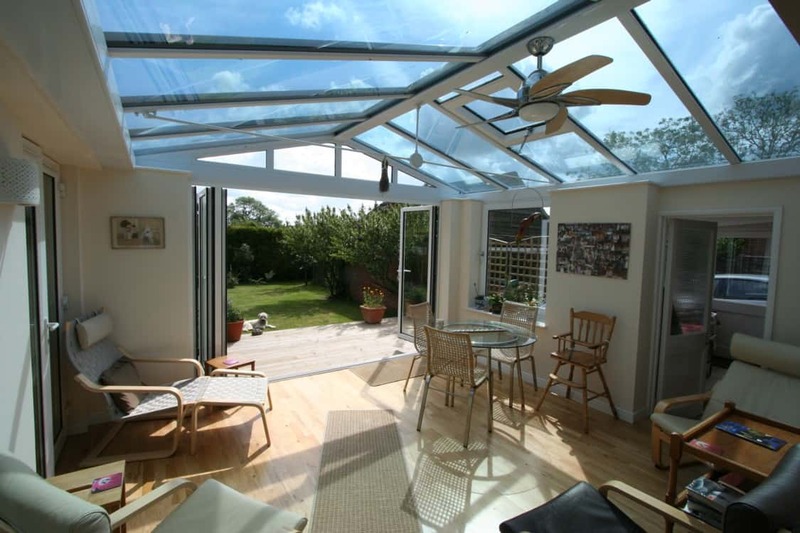 If you would like a glass roof, but also require some privacy, this is a point to take into consideration. Internal walls can be finished in brick, plaster or panels. 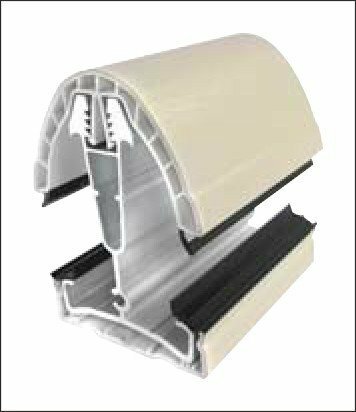 There are numerous options for; skirting, window boards, eaves trim, lighting, heating, electric sockets, overhead fans, handle finishes(see window and door sections) and flooring. 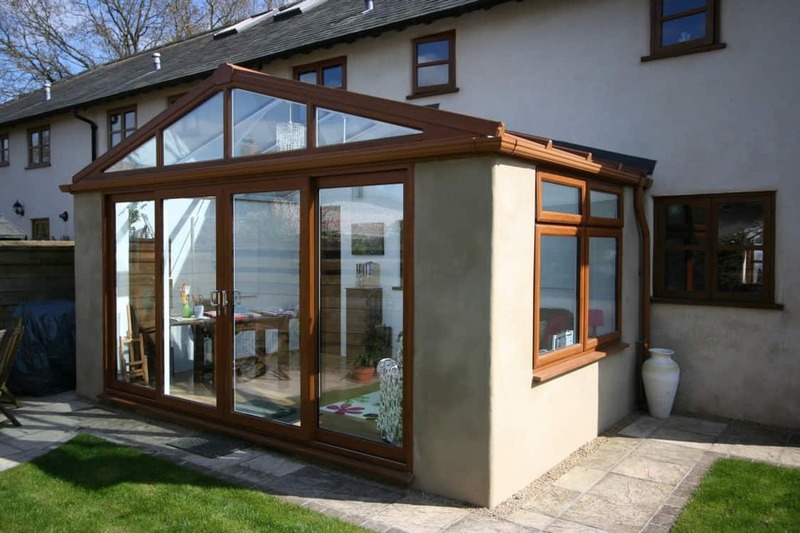 Dual colours and woodgrain foils are available to all our conservatories, which means you can have a different colour and finish internally, to what you have externally. This is very popular, with many of our customers choosing a white or cream finish internally, when a darker finish is required externally. The cost of a gable conservatory varies, due to the many parameters, however, a guide price for the supply and installation would be between £8500 and £25000. For a supply only conservatory the price would be considerably less, £2500 to £8000 as much of the costs are in the ground work, base work, electrical, plumbing, flooring and labour. Viewing our slide show video on building a conservatory will give you an insight into the cost difference between a supply only and supply and construction. This video can be found on the side bar, or further down the page if using a mobile or tablet. 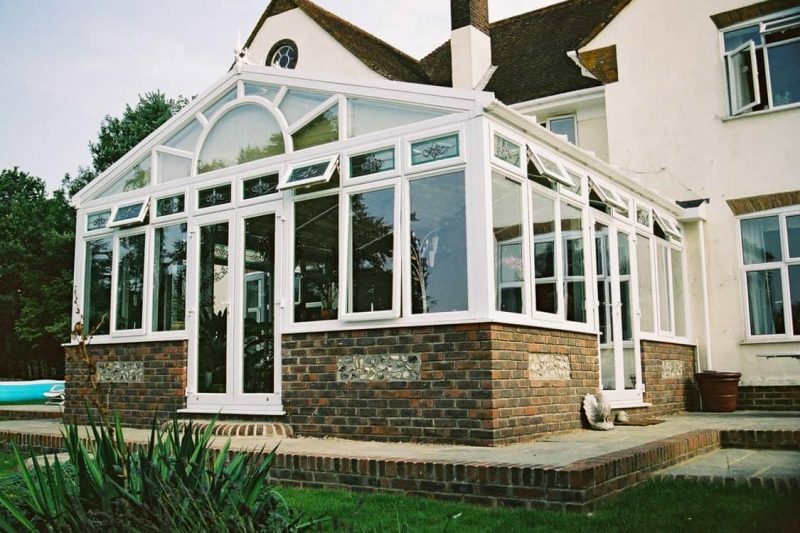 If you would like a free conservatory design and quote, then please contact us Test Valley Windows have a no pressure sales policy and do not cold call. All our conservatories are bespoke, so when designing your new room, you can choose from our vast range of windows, glass designs and doors. 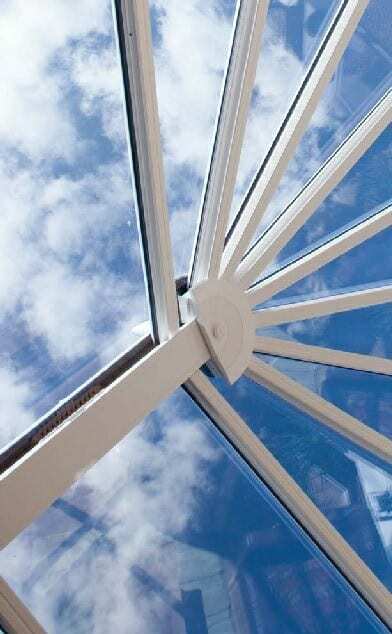 Your gable conservatory can have a glass or polycarbonate roof a solid roof or combination of both. 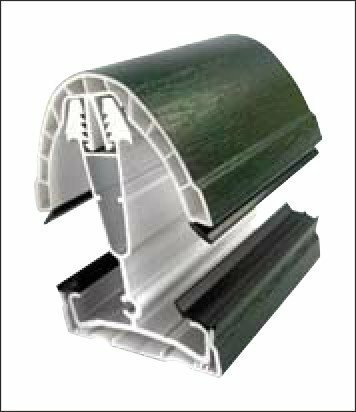 The side frames can be double or triple glazed with many different options of tinted, laminated self-cleaning etc. (please see below). Test Valley Windows can carry out all the works from start to finish, including ground works and drainage, brickwork, roofing, electrical, plastering, tiling or laminated floors and plumbing. 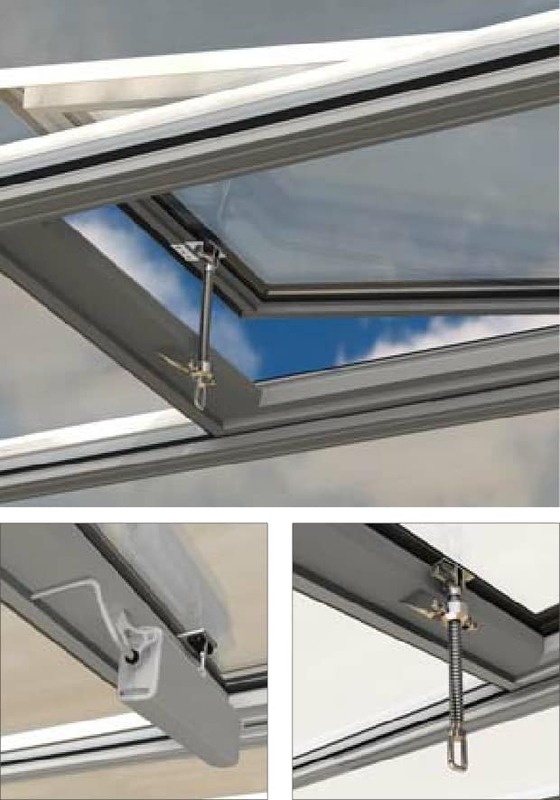 Test Valley Windows use many roofing systems depending on customers requirements. 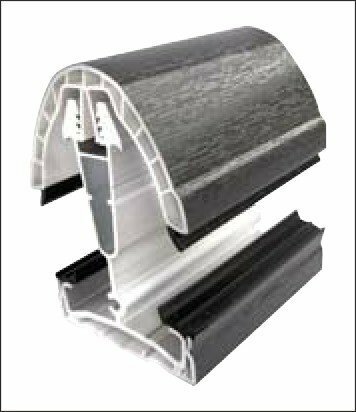 Our main roofing system is Ultraframe, and the following options are the main design choices of many. In addition to our standard white PVCu here are just a few of the wood-grained colours available as standard. We can also colour your roof to any RAL colour and match this to the side frames and guttering if you wish. 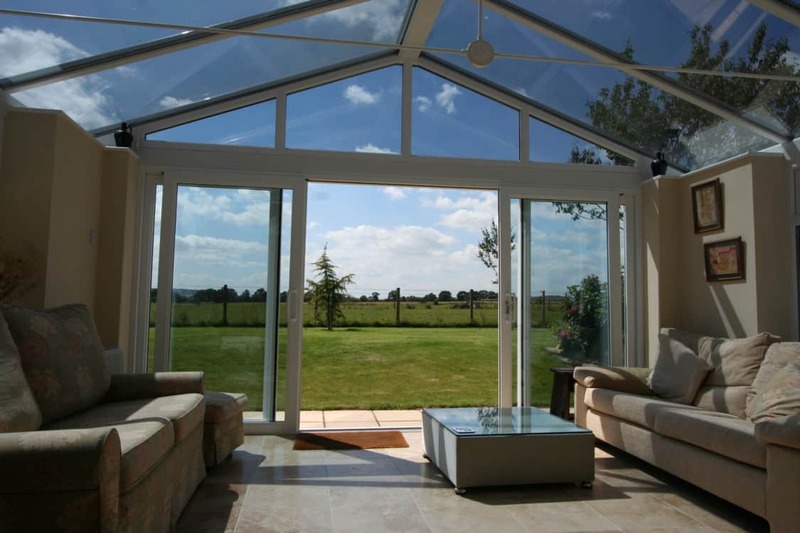 Are units made in Pilkington’s dedicated roof glass factory. True self-cleaning. Most dirt and grime will wash away when it rains. Cleaner – Choose one of our self-cleaning glass, and most dirt and grime will wash away when it rains. Every effort has been made to ensure the colours of the swatches printed above match as closely as possible the physical sheets. If you are in doubt about the choice of colour and its effect on your proposed conservatory we strongly recommend you ask for a swatch sample before purchase. 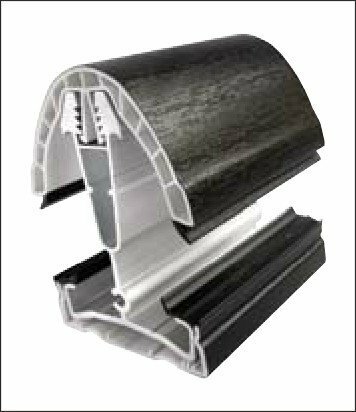 Test Valley Windows treats polycarbonate as a generic product and will vary its supply base from time to time. 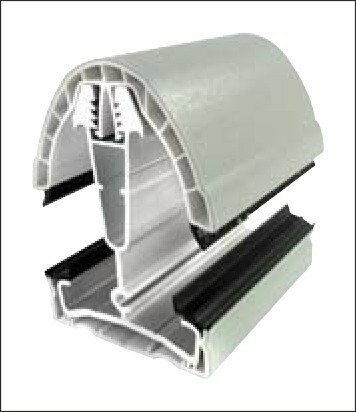 For side frame specification please view our window and door sections.